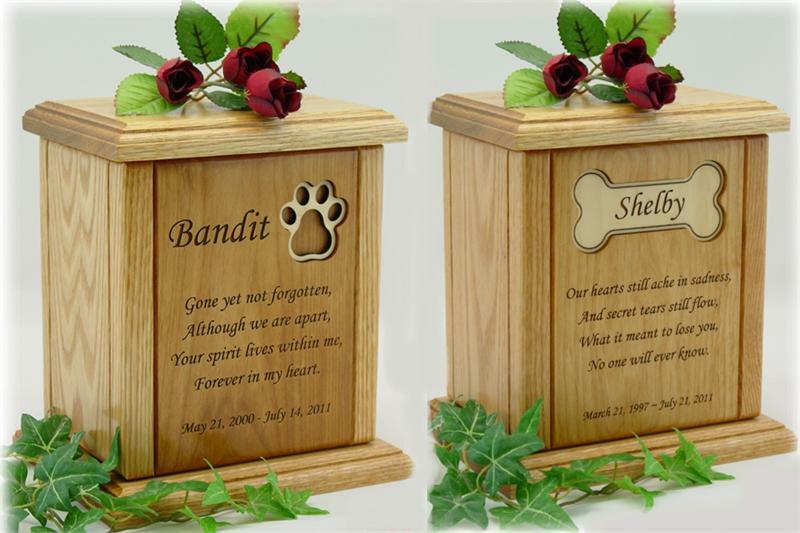 This select grade solid red oak and red alder wood urn includes either a maple recessed pawprint or bone and your choice of one of 4 poems; If Tears Could Build A Stairway, Losing You, Forever In My Heart or Never Forget. 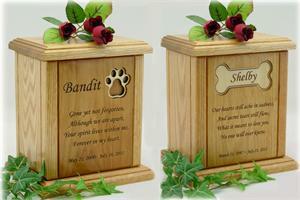 Also included is your pet's name and dates permanently laser engraved in the font shown in the body of the urn. Available in 4 sizes and with an optional Memory Chest* to store some of your pet's more precious belongings & momentos such as tags, fur clippings, collars, etc., while the separated lower area contains your pet's cremains. The memory chest is beautifully lined with a hunter green felt flocking on the sides and bottom of the memory chest area. The standard depth of the memory chest area is approx. 1-1/2" deep and comes with two hidden solid brass hinges and a solid brass friction latch. Made in the U.S.A., this is the smallest of the 4 sizes available.